Simple Prayers is a unique guide, stripping the practice of prayer to its very essence as a private act with powerful affect. In an extraordinary economy of words, the ten prayers touch varied aspects of human aspiration and need. 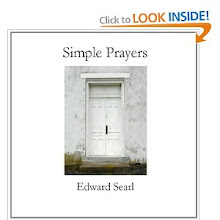 Created by a seasoned Unitarian minister known for his practical approach to the contemporary yearning for spirituality, these simple prayers address aspects of the Universal. It is a suitable resource for persons of all faiths and persuasions. Spirituality is a contemporary yearning. And prayer is a familiar religious discipline. Some who seek a rich and vital spiritual life explore prayer. For some-of-the-some, prayer becomes a meaningful discipline. Prayer seeks self-transcendence, as well as the religious experience of at-oneness. Simple Prayers offers ten one-sentence, mantra-like prayers. Each addresses an attribute of the Divine. Through brevity and focus, Simple Prayers seeks to make prayer a natural and integral act. Ed Searl established The Royal Nonesuch Press in 1978 to print a chapbook collection of poetic meditations he wrote as minister of the First Unitarian Church of Youngstown, Ohio. Similar collections followed, as he transitioned in 1983 from Youngstown to Hinsdale, Illinois. The Royal Nonesuch moniker references Mark Twain’sHuckleberry Finn, specifically the theatrical ruse of the Duke and the King. In recent years, the RNP imprint has published Searl’s books through the on demand resources of Create Space and LuLu.